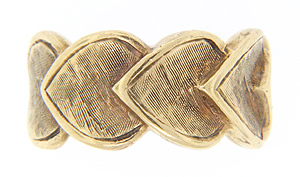 This 14K yellow gold vintage wedding band is crafted in an overlapping, repeating heart design. A smooth line outlines the heart while diagonal texturing lines fill the inside. 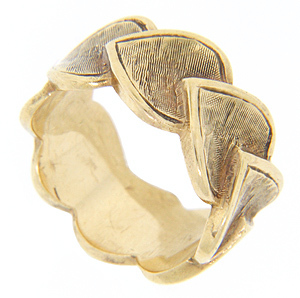 The ring has curved edges due to the shape of the hearts. The wedding ring measures 9.9mm in width. Circa: 1950. Size: 6 1/2. Cannot be re-sized.